Scouts and Venturers don’t sit still for long. 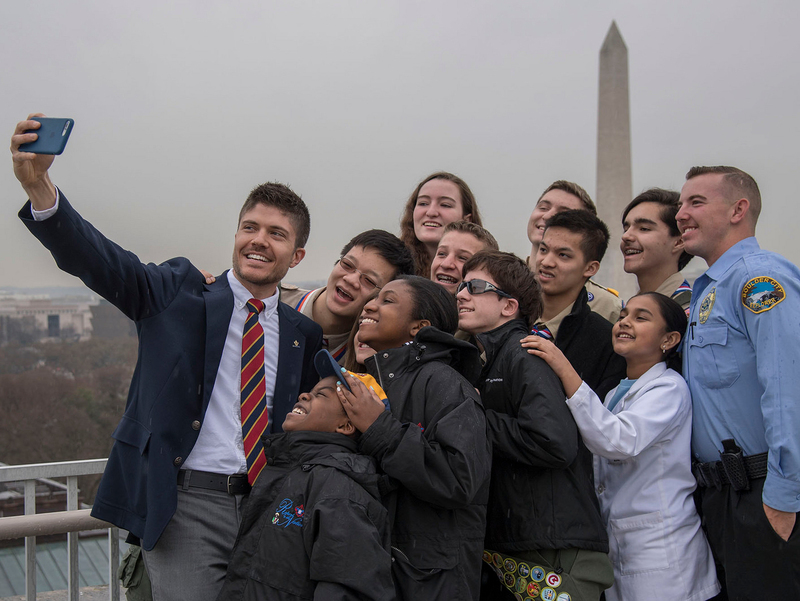 All that moving around — hiking, biking, canoeing, kayaking, climbing and more — is a big reason why young people join Scouting and invite their friends along. But that constant motion comes with one downside: It’s tough to capture on video without motion-sickness-inducing shakiness. GoPro is here to help. With its new HERO7 Black, the first name in first-person video says it has eradicated shaky videos forever. That’s big news for Scouts who want to document their adventures in crisp, smooth video. Better video makes it easier to recruit new Scouts, too. GoPro sent me the HERO7 Black and some accessories for testing. Two colleagues from the BSA Magazines team and I took the gear to a place with plenty of extreme motion: Six Flags Over Texas in Arlington. After a full day of hard work (riding roller coasters and eating chicken tenders), we identified five features that make the GoPro HERO7 Black a great option for troops and crews. But before the list, check out the video from our day at Six Flags. Naturally, it was shot on a GoPro HERO7 Black. 1. Smooth video makes Scouting activities look better. When bumping down a mountain bike trail or over whitewater rapids, there’s a whole lot of shaking going on. Through some sort of magic GoPro calls “HyperSmooth Video,” the HERO7 Black eliminates those micromovements that can ruin an otherwise epic video. It really works, too. While the roller coasters bounced us around, the resulting video — shot with the camera attached to a chest harness — is buttery smooth. 2. The GoPro survives drops and dunks. Tent poles get broken, hiking boots fall apart and zippers break. But the GoPro is one piece of gear that’ll survive the worst your Scouts — or Mother Nature — throw at it. The HERO7 Black, like many of the newest GoPro cameras, is waterproof without a housing. We didn’t test this, but GoPro says you can take it down to 33 feet without issue. We didn’t plan to test the camera’s claims of being “tough as nails” either. But then I dropped it as I was taking it out of my bag, and … yeah. It still worked even after a waist-high fall onto concrete. Phew. 3. It offers live streaming. For Scouts and Venturers, Mondays are for show and tell. They tell classmates about all the awesome adventures they had over the weekend and show them video proof. But what if those “wish-I-was-there” moments were streamed live on YouTube, Twitch or Facebook? With the GoPro HERO7 Black and their phone, Scouts can stream directly to those platforms and more. This could be used for high-adventure outings, weekend trips or even troop meetings, when one or more Scouts can’t make it in person. 4. It gets time lapse right. I love a good time-lapse video. Sunsets, building construction, interesting traffic patterns — I’ll watch them all. You can shoot a quality time-lapse video on most newer phones, assuming the camera is stationary. The phone will automatically take one photo every 2 to 10 seconds. But if you shoot this time lapse while moving the camera, the resulting video is choppy. GoPro’s TimeWarp Video mode changes all that. It allows smooth, stabilized time-lapse video even when you’re moving. That makes this a game-changer for any linear Scouting adventure — a hike down a trail or paddle down a river, perhaps. At Six Flags, I held the GoPro in my hand as we walked around. As you can see in the video above, the result is a video that lets you smoothly speed through a scene. 5. You can slow things down — way down. Sometimes you want to speed things up, and sometimes you want the opposite. The HERO7 Black can shoot 1080p video at 240 frames per second, which lets you slow things down — way down. That means you can relive those “it-only-happens-in-Scouting” moments at one-eighth their original speed. Speaking of GoPro, there’s still time — but only a little — to become a GoPro Adventure Ambassador. Learn more here. And don’t forget about GoPro’s VIP program, where Scouts and others can purchase GoPro products at a discounted rate. Find details on the contest entry page.